I never get out on my own. 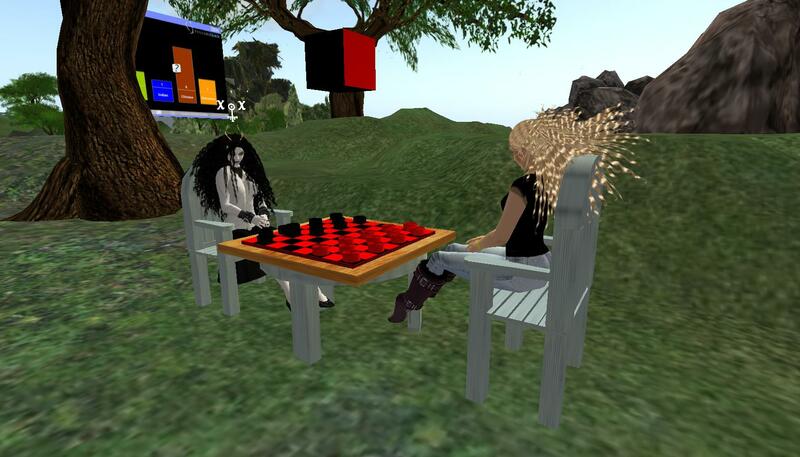 Once I login, I start chatting with friends. I’m usually hanging about at my house chatting. Or I head off for live music and dance and chat. But I rarely go exploring on my own. So it’s a very good thing that I have friends who drag me out to fun places. I have learned that when Calli, Panacea or Oura IM me and say: Come here NOW! that it’s best for me to listen. *grin* And you all thought I was so headstrong. Panacea finds me Peep racing, musicians and carousels. Oura takes me shopping and to good music and to cool builds. Calli takes me to revivals and trains and music. I am soooooo far behind on my blogging, believe me. So I was hanging about relaxing the other day. Yes, relaxing. It was post-deadline day. Calli sent the familiar IM: Come here now! Even as I typed “where is here?” I was hopping in the taxi. 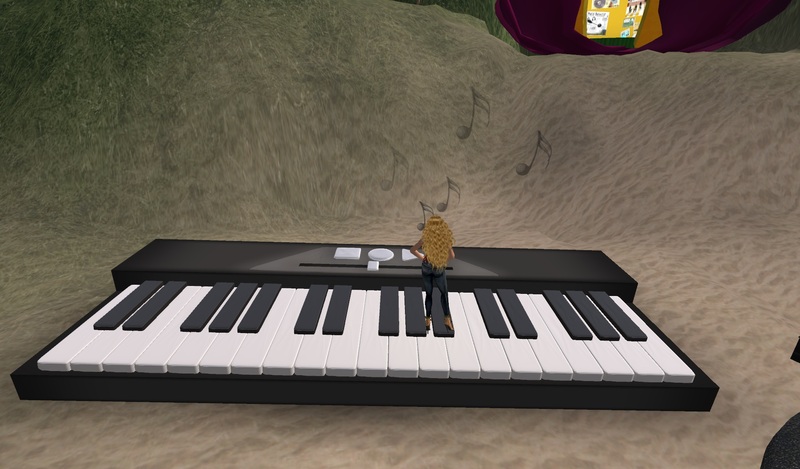 As I rezzed, I found myself on a giant keyboard. Of course, as has happened lately, Calli and I exchanged hello, how are you and then she crashed. *grin* Really – I bathe regularly. I waited for her to return, but this appeared to be one of those “the whole machine has gone pfffft and needs to be rebooted entirely” crashes. So I wandered up and down the keyboard. 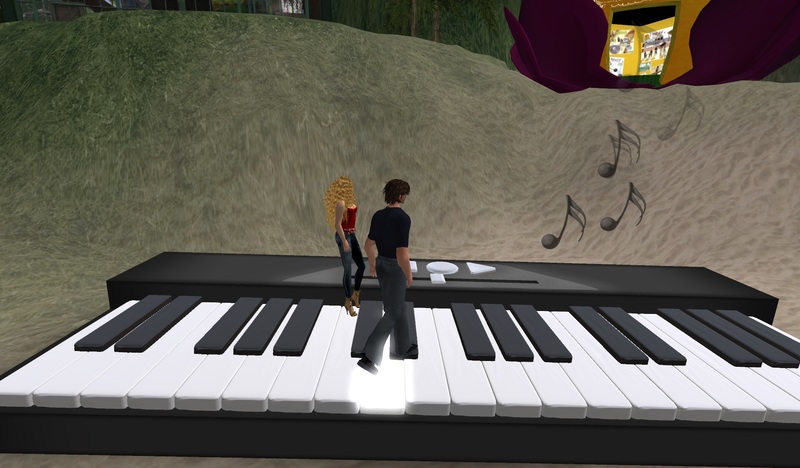 As you strike a key, whether by walking on it or touching it, the note plays and a musical notation appears. I love it. But the graphical notes fade so quickly I wasn’t sure that my pictures were capturing them. So I sent the taxi to Oura and Jonah to join me. 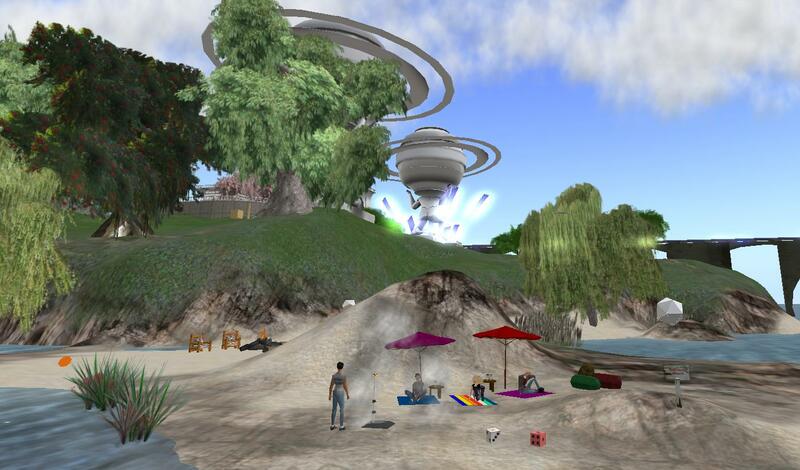 More SL strangeness – Jonah could tp in but Oura could not. But something had to give in that push and unfortunately that something was my health. I sort of hit the wall and went splat once the footage was recorded. So I have been in recuperation mode. I’m on vacation and I’m actually sticking to that – resolutely ignoring emails from work, not looking at the many feeds. I sleep, I do nothing, I read and then do more nothing. 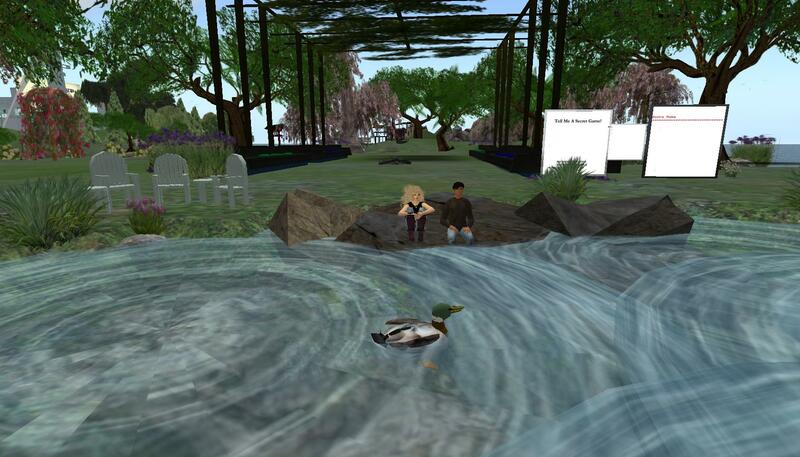 In sl – I’ve retreated to my playhouse. I go to live music, chat and do a lot of nothing here, too. *grin* Oh wait – that’s what I ALWAYS do. Oura, however, decided that my spirits needed a boost. So she got me a new toy for my playhouse. Oh, anyone could have a rocking horse. 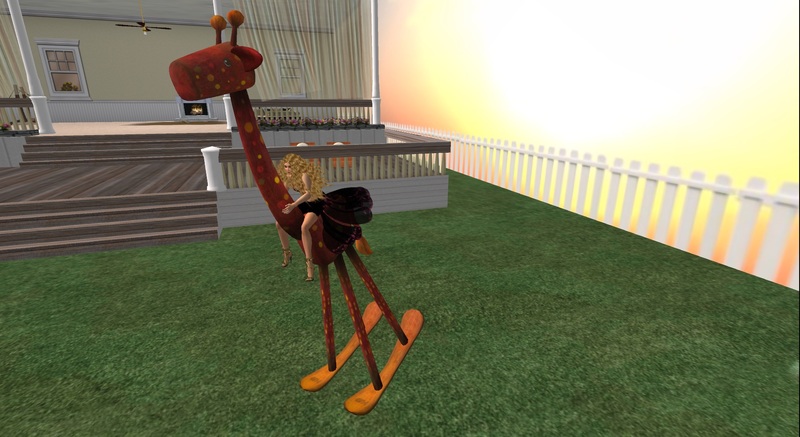 *I* have a rocking giraffe. I rezzed him out today. His name is Jasper. Why Jasper? 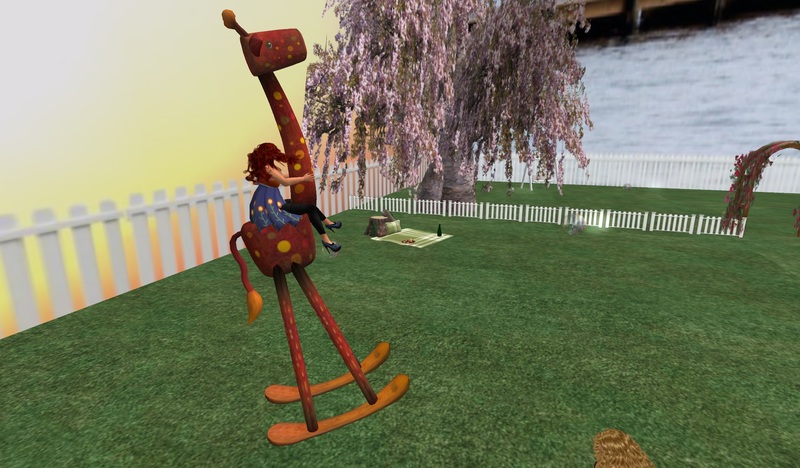 Because one of my absolute favorite books as a child was Jasper Giraffe. In it, poor Jasper falls down and hurts his knee. 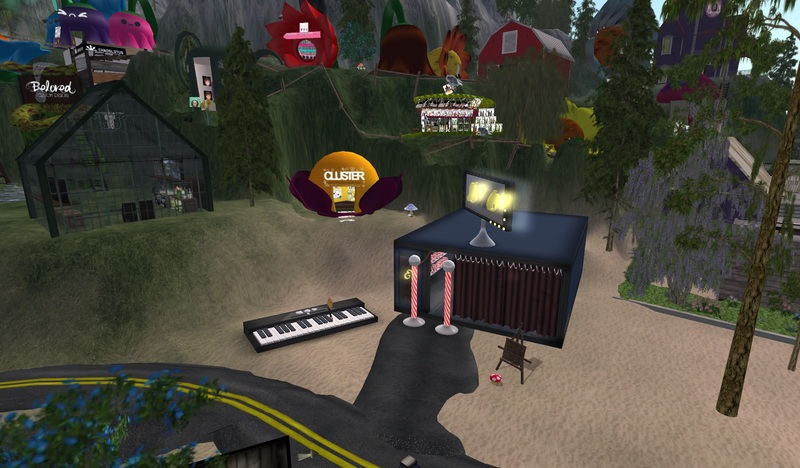 Polly Parrot flies through the forest telling everyone and the presents and get-well cards stream to Jasper. *grin* I loved it. I could read it endlessly. Make my mother read it to me endlessly. So Jasper has taken up residence in my playhouse. Calli is always inviting me to do fun things with her (and then she crashes when I get there). I have 2 not-yet-written-posts about cool things Calli found. So I was very happy to invite Calli to join me and try Jasper on his initial run. She was dressed perfectly – they matched! Then we sat and shmoozed til she had to work and I had to nap. A lovely morning. I don’t really care what the media reports: I don’t think the economy is turning around all that quickly. We are all feeling the problems of a slowed, stumbling economy. But some people are getting hit worse than others. 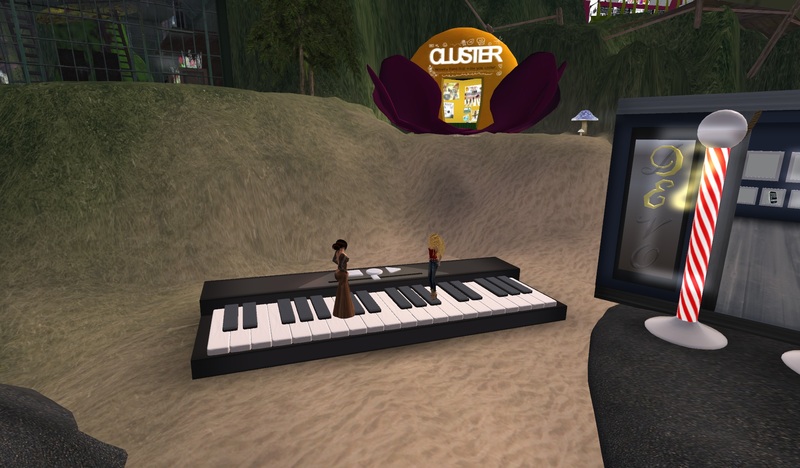 Cypress Rosewood, an SL musician is having an especially poor 2010. It was just a few months ago his home was burglarized, his musical equipment stolen. Thanks to some good fortune and quick-thinking friends, most of the equipment was ultimately recovered. But not all. And there was damage. So it seems particularly cruel fate that the flooding in Nashville, Tennessee has cost Cypress his home and store. Sometimes it’s hard to know where to start to heal the world. I have no doubts this week. I’m doing what I can to help Cypress Rosewood. 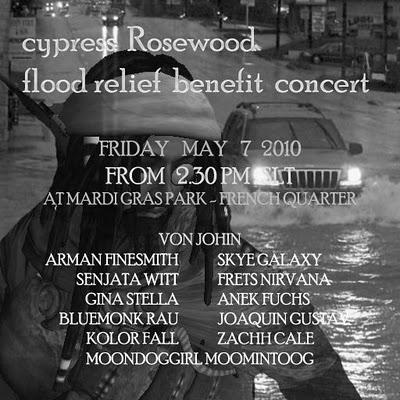 Over the past weekend Cypress Rosewood lost his home and shop to the devastating floods in Nashville Tenn. Friends of Cypress have responded and are calling for a benefit held this Fri Please note times we hope you can stop by and give some support to one of SLs’ beloved musicians. If you can make it to Mardi Gras Park on Friday, May 7 and help out Cypress then I hope you do so. Please share this with your friends!